Entire Business Technology Supply Chain! Tired of silos that prevent you (or your staff) from having the information needed to follow a more strategic, proactive approach to service delivery? Enterprise Integration’s (EI) Service Delivery Intelligence (SDI) provides you with one easy-to-use dashboard that displays data flow, capacity, network and server usage and more. At last, you can have fast, convenient access to the essential technology information you need to guide your business forward on the best possible path. This tool breaks down silos and allows you to see information from across your organization with one interface. You can see overall ecosystem health in an instant anytime you want. You’ll also enjoy faster time to issue resolution since you’ll only have one place to go to for all data and the data there will be correlated with EI’s innovative Digital Robotics Engine (DRE) which can actually identify and resolve issues on its own! With SDI, you get a simple, unified view of your entire business technology supply chain from endpoint devices, routers and hubs to wireless networks, database servers and all the way to the datacenter. No longer will your IT team lack true visibility into their systems, leaving them unable to quickly and efficiently identify and remediate issues. With SDI, IT will have the ability and resources to focus on breaking down silos, minimizing end-user down time and concentrating on truly transformative work instead of spending time managing basic maintenance tasks. SDI is the intelligence that our renowned DRE is based on and it’s all data driven. This is important because being “data driven” leads to insight and insight leads to actionable scenarios and it’s these scenarios that can save your company lots and lots of money in the future. SDI is a big data warehouse that will allow you to do a lot more than just understand why something happened. It will also allow you to make decisions down the road based on what happened or what didn’t happen or what could have happened (in cases where our DRE acted and prevented an incident from occurring). Instead of constantly seeking the information you need to make decisions you will have it all right at your fingertips with SDI. You can see a broad overview or you can drill down into specific areas and get very detailed information. Get the Data You Need With SDI! The system includes inbound reactive response through Digital Robotics Engine™ where system events are acknowledged and assessed without IT workforce interaction or intervention. So instead of being overloaded with non-essential tasks, staff will now be free to tackle more important projects. SDI proactively manages routine maintenance such as documentation, auditing, rebuilding indexes and patching. This will boost system performance and improve control of vital operations. SDI automates common IT requests such as server builds, monitoring deployment, website set up and permission changes. This automation framework frees up your staff to focus on more strategic tasks. 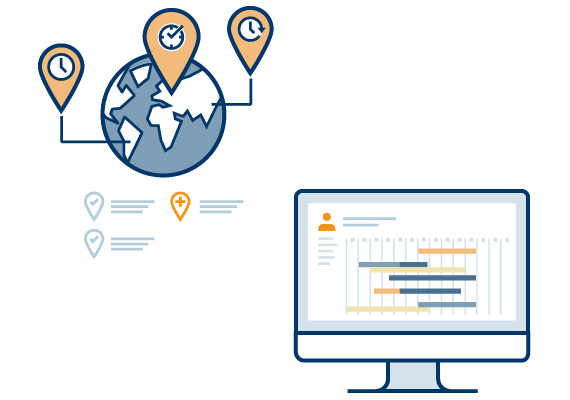 Discovers, maps and visualizes all core components of your IT Supply Chain and their interdependencies. Monitors and resolves in real time any issues, potential issues and shows the health of the total business technology supply chain. You see, SDI and DRE are the perfect pair, combining to provide a unified view of systems and tools by correlating data into a simple user interface. SDI collects the data and DRE analyzes the data and determines what should happen next. DRE monitors your system constantly analyzing the data collected by SDI. When DRE receives an alert it follows standard ITSM workflow by creating a ticket and resolving the issue when it can. This setup allows issues to be resolved before they affect end users. If DRE can’t resolve an issue, it will send the ticket on to a technician. DRE is not environment-specific, so an IT engineer can create a process to automate redundant tasks and to receive alerts only if an issue needs to be resolved by a person. Your staff saves time and becomes much more productive. SDI provides an improved service experience by detecting and resolving issues before the engineer can be alerted. This tool has an easy to use but sophisticated dashboard where business users can make decisions faster and more intelligently using data visualization. SDI’s automation component alleviates the growing management burden on IT departments and allows them to focus on more important strategic issues. This EI solution breaks down data and application silos through integration tools. Silos evolved over the years due to a lack of a comprehensive vision for service delivery, however, SDI delivers tools that help organizations share data, information and applications for improved collaboration. SDI displays an end‐to‐end view of the business technology supply chain, making the organization aware of problems before they occur and resolving them quickly when they do occur. The challenge facing modern IT organizations is that systems have become so complex that interconnected issues within the system can go unnoticed until an “event storm” erupts. SDI gives IT departments a comprehensive view of what’s working, what isn’t and where the organization’s performance is being impacted. Productivity and efficiency will soar! SDI is data-driven solution that doesn’t just solve problems, but actually anticipates, identifies and avoids problems throughout the business technology supply chain. You get a highly automated framework to monitor and manage your entire business technology supply chain. Hurry, Our Schedule Fills Fast!